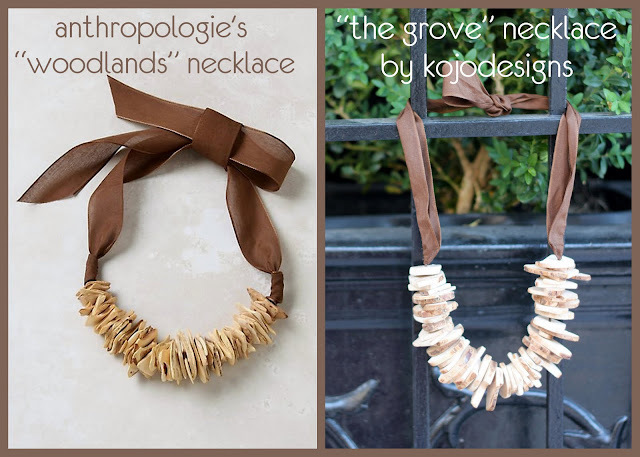 I’ve dubbed this one The Grove Necklace… that has a nice, forrest-y ring to it, don’t you agree? Plus, it’s a little shout out to our Alma Mater. Love that place. Take a big branch and cut it into little discs- we Adam used a miter saw. Use scissors to cut the wooden discs into fragments (halves and a little bigger than halves). Sand off all of the rough edges, making the edges round and smooth and the front and back matte. Using a dremel tool, drill small holes in the centers of the wood chips. Thread a tapestry needle with a thin ribbon and pull the ribbon through the small holes. Using your linen ribbon (matching it up to your wooden beads), ensure out your preferred necklace length. Give yourself a little extra length and cut your linen ribbon. Hem each end. Match up the thin satin ribbon along the center of the thick linen ribbon until the ends overlap (your linen ribbon should be one long continuous length, not two separate lengths). Sew in place. Your sewing machine won’t go all the way up to the wooden beads. With the bottom edges that weren’t sewn, pin into a triangle and hand sew in place. Bonus- this gives your edges where the linen ribbon meets the row of wood a neat, finished look. I like yours better than theirs actually! I consider myself very crafty, and I don't think I would have though to use the drill or to sew that second ribbon onto the first. Thanks for this! that necklace is stunning! over-the-top earthy and warm… amazing! ok that is amazing. LOVE it and its big beautiful chunky self. By the way, My good good good friends all went to Grove City! well, no they had 4 kids and 3 of them went to Grove City 1 went to The Naval Academy… amazing. Small world. You are creative I am going now to find a branch and my husbands saw and dremel… thanks for the inspiration. wow! that is so cool! love it and seems like it is easy enough to do…now if i could just find a branch?! Olá, adorei sua idéia do colar.Vou fazer um para mim.Parabéns! Very cool necklace. I am amazed how you were able to cut your wood pieces sooo thinly. I would have like to seal each slice of wood with the bark with poly urethane and then drill holes for the ribbon. the color would have darker wood tones due to the bark. Thanks for the idea! Great idea, love do it yourself for less. Tres chic! That is fabulous! I love it! Thanks for sharing! ok….um, could y'all be ANY cuter!?! 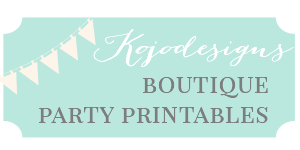 i'm officially a kojo believer 🙂 thanks for the email…so happy to find you blog! i checked out your "party" tab and you two are ROCK STARS! i love throwing parties too…if you lived closer we could really do some damage 🙂 i'm planning a carnival bday party in a few weeks…shoot me an email if you've got any great ideas! have a great weekend!